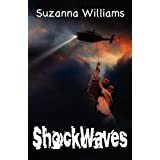 Review of ShockWaves by Suzanna Williams. I watched the book trailer for ShockWaves and was very excited to read the book. Check out the book trailer below. You will definitely enjoy it! I thought, “If this book is as good as the trailer, I am in for a treat!” And to my pleasant surprise , the book was just as good as the trailer if not better! I absolutely loved the two main characters. Paige, a young girl whose parents were just killed in a car accident, was moved into a foster home where she meets Lee. Lee is an athletic young man whose mother had also died and his father is not in the picture. The two teens have a strange connection. Lee sees what happens to Paige, and Paige sees what happens to Lee. When Paige is kidnapped, Lee is the only one that can help track her down and save her life with the help of his visions. This is a fast paced, super suspenseful, awesome story! And I have to admit, there were quite a few nights in which I stayed up way too late because I could not put this book down! I definitely recommend this book to anyone who likes action packed suspense, gripping mysteries, and a bit of sci-fi! On a scale of one to five, I give this book a FIVE STAR! Go here to get your copy of ShockWaves on Amazon.com. Go here for Amazon.co.uk. Follow author Suzanna Williams on Facebook here.